Among Hong Kong shopping malls, this one is extremely well-planned. If you have a particular product in mind, this could be an ideal place to buy. At the heart of Causeway Bay shopping area, Times Square has a different theme on each floor, such as children’s goods, audio-visual and telecom products, sports goods, fashion and accessories. The goods here are far more economic than those of IFC, Landmark and Pacific Place. It is my favourite shopping mall. 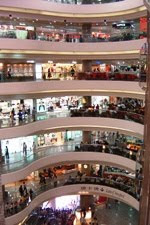 Inside the mall, there are four levels designated to restaurants. You can spend a day here without getting hungry, nor getting wet on a rainy day. The boutique hotel Holiday Inn Express is just across the street.